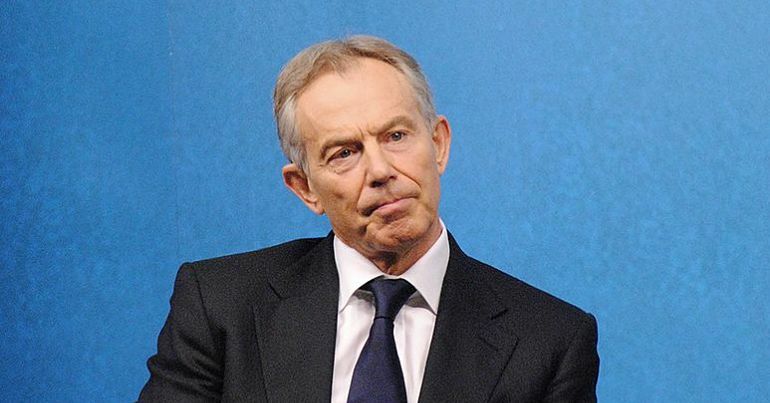 It’s been a ‘tough’ few days for Tony Blair. While the former prime minister’s attempts to derail Jeremy Corbyn are proving less and less effective, his centrist veil has fallen off twice in one week. On 5 September, it was reported that Blair had held a “friendly, positive meeting” with Matteo Salvini, the Italian interior minister and deputy prime minister. Salvini belongs to Italy’s far-right League party, which is in a coalition government with the anti-establishment Five Star Movement. In June, Salvini threatened to censor and expel thousands of Italy’s Roma population. As the Guardian reported, he’s currently under formal investigation for the “possible illegal detention and kidnapping” of over 100 refugees, who were “forcibly kept on a docked rescue ship”. His critics have claimed his policies are reminiscent of Italy’s fascist past. On 4 September, Salvini tweeted that his meeting with Blair concerned “immigration, Brexit, and energy policies”, as well as “a conference on development and investment in Africa”. The real reason Blair met the Italian interior minister, however, was reportedly to discuss “controversial plans to extend a gas pipeline that will run from Azerbaijan to Puglia in southern Italy.” Blair is currently a consultant for the autocratic Azerbaijani regime. On 6 September, the Tony Blair Institute published accounts detailing “donations of up to $12 million” from Saudi Arabia. According to the institute, the payments were made “to help with a programme of modernisation” for the country. Saudi Arabia’s pretence at modernising would be laughable – were it not for its sustained oppression of women, punishment of homosexuals, and its use of capital punishment (including crucifixion). And that’s just talking domestically. Saudi Arabia is one of the chief exporters of global terrorism and is responsible for the mass targeting of civilians – including children – in Yemen. For 70 years, the Western media has been buying Saudi Arabia’s language of ‘reform’ almost without question. According to the New York Times, King Saud was a “liberal champion of constitutional reform”, King Faisal “led Saudis into 20th century”, King Khalid was a “moderating force”, King Fahd was part of a “progressive, modernizing faction”, and King Abdullah was a “social revolutionary“. And now the country is supposedly “going through its own Arab Spring – Saudi Style”. The Blair Institute’s “programme of moderation” for Saudi uses a similar language of ‘reform’. History suggests reform will not be forthcoming. On 7 September, Blair complained that he was “not sure it will be possible for “moderates” to regain control of the Labour party”. After Blair’s centrist veil has fallen off twice in one week, his idea of ‘moderation’ comes into serious question. What is striking is that Blair is more critical of his own party’s leader than he is of the dictatorships from which he is happy, of course, to accept employment. Yesterday he confirmed he received up to $12m from Saudi Arabia – which beheads people and is responsible for the slaughter of thousands in Yemen. Perhaps we should thank the former prime minister. After a week of own goals, Blair is doing all the hard work for those working to discredit political centrism. – Read more of the Canary‘s reporting about political centrism.